In the winter months, we all need to take additional steps to protect ourselves from the cold – warmer clothes, a heavy coat, a hat, mittens, a scarf, and boots with good traction for the snow. It’s also a good idea to protect your car during cold months by winterizing your vehicle before the beginning of the season. This is essential, as cold temperatures make it difficult for engines to work properly, snow limits tire traction and salt causes rust and gravel pits on the exterior paint. Properly inflated tires ensure the best possible connection between your vehicle and the road, especially in slick conditions. 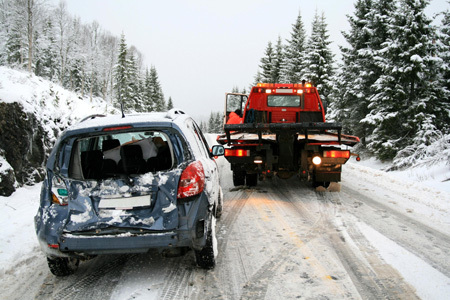 Cold temperatures cause tire air pressure to drop since gases contract when they’re cold. Viscosity of oil – how thick it is – will change depending on its temperature. The colder oil is, the thicker it will become. Consequently, thick oil does not circulate through an engine as easily as thinner oil during start-up. To reduce the risk of problems with your engine oil, place thinner oil in your engine before the cold weather season. At Eaton & Berube, your safety is important to us. For additional safety tips and useful resources please subscribe to our blog or contact us.